My general health remains good, and my allergies have settled down. Classes are going well. 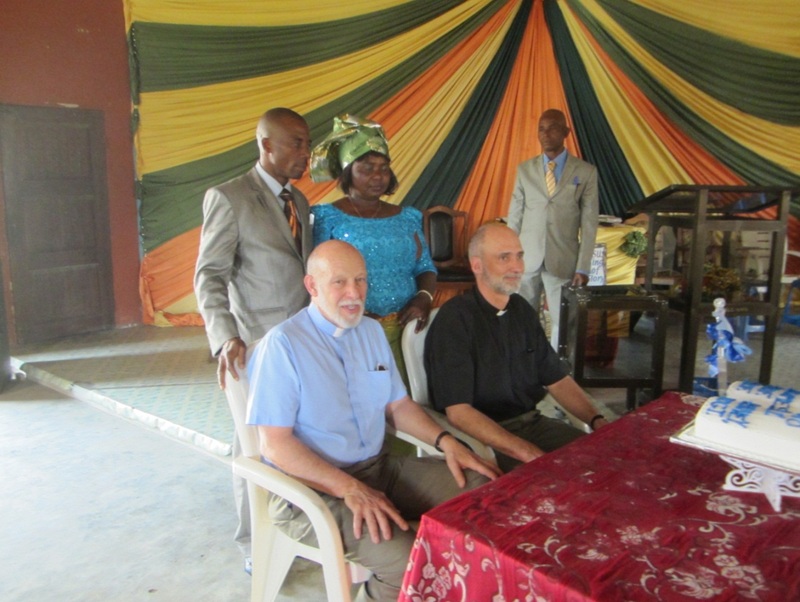 See the attached file for some idea of our life at Nigeria Lutheran Seminary. I guarantee that this is a teaching spot I will never forget. P.S. I’m attaching some pictures. The week in brief – no electricity, no rain, no cooling, but also no mosquitoes, no flies, and no health problems. Praise the Lord! Saturday == The trip to Abak took us to Johnny’s son’s Internet “café.” (Johnny is the seminary’s cook and caretaker who takes good care of us.) Surprisingly it had about a dozen good computers and a very fast Internet connection. I mailed the first week’s report to family, some friends, and a few mission officials. We were charged what we suspect was a “white man’s” price, $7 each for 40 minutes. We stopped at the Christ the King congregation in Abak. It was also a nice building which held about 150 people. The pastor said that it was full each Sunday. We met the pastor and his family. Last stop was to one of Johnny’s daughters who has a small beauty shop from which she also sells her homemade hats, necklaces, and purses. The hats were brightly colored with lots of flowers and ribbons. The necklaces and bags were made of bright plastic beads. I think she was disappointed that neither Ken nor I bought anything. I had thought I might buy Sandy a present, but I didn’t see anything that I thought would fit her tastes. One thing you notice is the great number of small churches, many of them just in people’s home. We counted 26 along the ca. 5 mile road from the seminary to Abak. The day ended with a social call from the chief. He came in and visited for about 20 minutes. He said he was extremely happy that the charismatic turmoil which threatened to split the church a couple years ago has now been resolved and without the loss of any pastors or congregations. I gave him one of my clinging crosses. 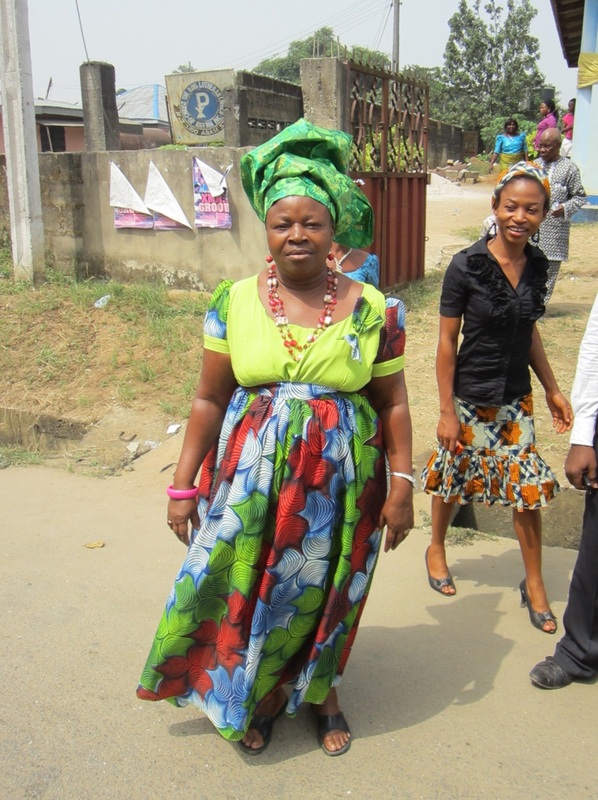 Sunday – we were taken to the congregation in Uyo, the state capital. Because of some detours we arrived 30 minutes late at 10:30, which turned out okay since there still were two hours of service left. On the way we passed several burned out cars and trucks. We were told they are the remains of the political violence during the recent election. This congregation also had a nice building. There were about 55 in the service. Many things were the same as last week – loud, enthusiastic music; line dances (five times) up to the offering box with the music and drummer getting louder and faster as the procession continued. Some things were pleasantly different. There was a confession of sins, the Apostles Creed, three Scripture readings (from the KJV) and a 20-minute sermon. The pastor, who turned out to be a preaching elder (not a full pastor), had a free delivery and kept everyone’s interest. Oh, I forgot to say that we understood this week because nearly everything was done in English. The sermon had the theme “Time for Change” and clearly pointed out ways that each of us can change to be more God-pleasing in the coming year. Unfortunately Jesus Christ was never mentioned nor was there any perceivable Gospel motivation. Ken tried to correct that a bit in his greetings to the congregation afterward. I had a few uneasy moments when the leader announced that it was now time for “tongues-speaking,” and then repeated the announcement twice more. It wasn’t until the fourth time that I realized he was saying that it was time for “thanksgiving,” i.e. another offering. The congregation received a special gift from its youth – a large speaker to further blast out the music. We wondered if it were really necessary. We were given the royal treatment. A special “New Year’s cake” had been baked and decorated with our names. We were asked to sit in the front before the cake and have our pictures taken with the deaconesses, then the elders, then the preacher and his wife, then the congregation, then the choir, then the children, then the cake designer. After the service we were invited for beer, cake and conversation at the preacher’s house which was on the grounds behind the church. On the ride back we learned that Christ the King church has 52 congregations, but only 12 pastors. So most congregations are served by an elder, most of whom have almost no theological training. 27 laps in the warm afternoon sun – about 90 minutes. Each time around we eavesdropped on a conversation 4 or 5 of our students were having with a visitation team of Pentecostals who had stopped by for a doctrinal discussion. I was surprised that the Pentecostals denied the Trinity. Ken told me that about 25% of Pentecostals are modal monarchianists (i.e. Unitarians) who deny that the Son and the Holy Spirit are individual persons within the godhead. One of the students stopped by in the late afternoon to bring a request from the students that afternoon discussion times with the professors be arranged, which we said we were happy to do starting tomorrow. He also told us his personal schedule. He goes to bed at 7:45 and sleeps until about 11:00. Then he gets up and studies from 11:00 until 4:00 A.M. In the afternoon came the first open meeting with those students who were interested to discuss anything they wanted to talk about. I had the first one. Six students came, and we had a pleasant 75 minute conversation. Afterwards Ken and I took a 30 lap constitutional. During the walk a former pastor stopped by to tell us that all the pastors were dishonest crooks. Tuesday – I was awakened twice during the night by load chewing or scraping sounds which seemed as if they were in my bedroom. We concluded that it was probably rats in the attic over my bed. “They won’t hurt you” was the caretaker’s reassuring words. I can’t complain, however, especially after I stopped by the students’ bedroom. Eleven students sleep in a small room which is wall to wall beds. In fact, there are only ten beds, so one student sleeps on the floor. I didn’t ask if the same guy always got the floor or if they pass the honor around. 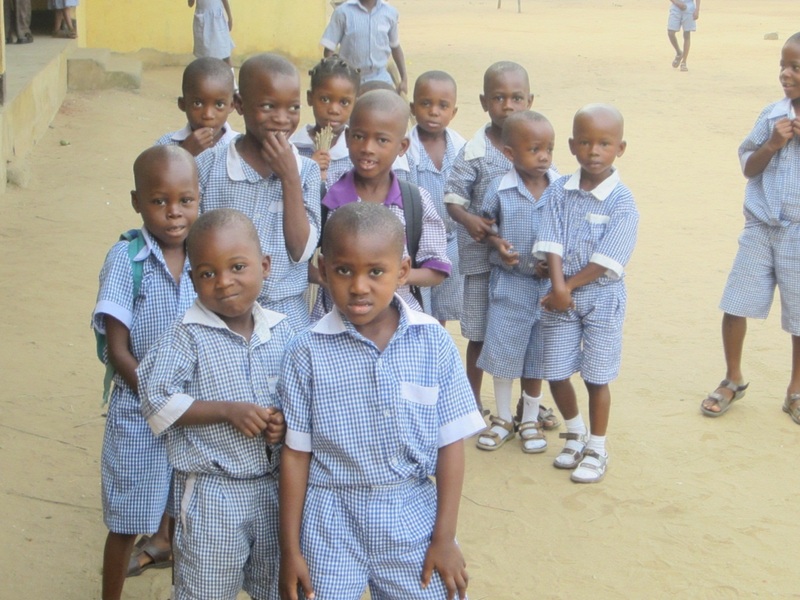 The students’ toilet facility is an outhouse which they share with the 150 or so children in the primary school. I gave the mid-term test today. All the students did okay and passed. 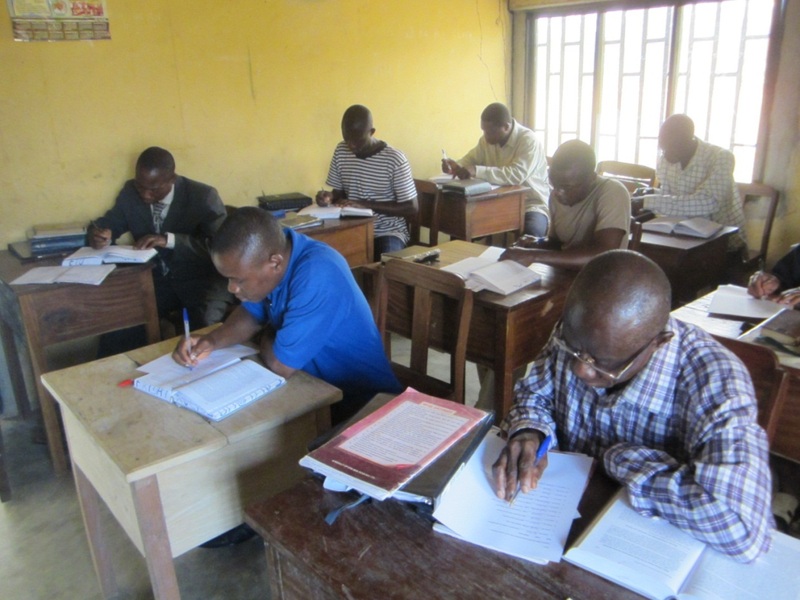 The Nigerian seminary regards 50% or above as passing, but all but one student would have passed even under the stricter U.S. system (70%). It’s an extremely hot day with no air movement, but we walked our 30 laps. It took about two hours. The cold water shower felt great after that. Wednesday – No rat activity to disturb this night’s sleep. We woke to a thick haze over the landscape. It developed from there into the hottest day so far. The thermometer we have said it was 90 inside the house. Outside the sun was beating down from a cloudless sky. The students and guards also commented on how hot it was. We walked 31 laps, then. after a quick change of clothing, went to the weekly seminary worship service. Sweat poured from me, soaking my clothes, and leaving a small pool of water under my seat. Our cold water shower doesn’t seem so bad anymore. Classes are livening up now that we have moved on to studying the life history of Jesus. I covered only half of what was blocked out for today. One of the students stopped by to show us a falcon-like bird he had trapped. He called it a kite. He said he would kill it for a meal. Later in the day we learned, however, that instead he had set the bird free. 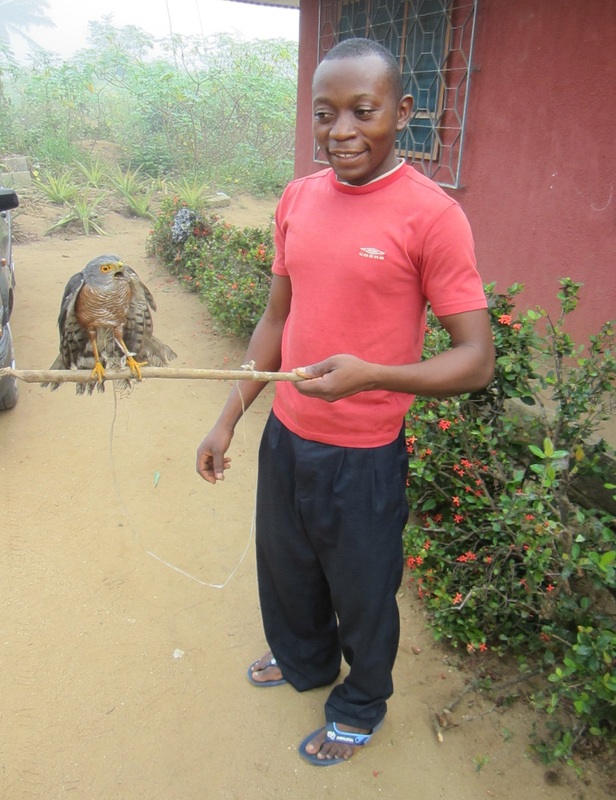 Student Sylvester with the kite he trapped and later released. He looks young, but he’s 28 and quite a hunter. We’re being fed plenty although there’s not a lot of variety. For breakfast it’s oatmeal or French toast or crepes or a plate with eggs, baked beans and slices of a fried fruit which is something like banana. For the main, noon meal it’s chicken and noodles, or chicken and rice, or a ground meal pie, or fish and yams. There’s usually chopped cabbage for lunch and fresh fruit, either sliced pineapple or an orange. The evening meal is light – either a buttery spaghetti or popcorn. Thursday – The days are becoming routine. Lots of dialogue with students has resulted in my being a day behind the plan I’d blocked out. Six of the students also came in for the hour and a quarter of open discussion in the afternoon. It’s another hot day. We got in 32 laps. I’ve now gone to two showers a day and stay under the cool water a much longer time. I have a new theory on the loud chewing sounds which awoke me a couple nights ago. Termites. I found a fresh pile of sawdust by the bookcase near my bed. Friday – Two weeks down; one to go. The student had an intriguing theme for his chapel devotion today: “Do not eat religiously.” It was a pretty good sermon, but we never did find out what eating religiously Is or why we shouldn’t do it. There are virtually no cars in this village or area. The car we are driven in has been rented by the seminary for our stay. The pastors, students and nearly everyone else get around on motorcycles. It’s not uncommon to see three or even four people maneuvering around the potholes on the dirt road in front of the seminary. Even the taxis in the state capital are three-wheeled scooters with a seat for two or three people behind the driver. 33 laps today, cheered on by the guards and a collection students who sat in the shade.